We looked forward to a rendezvous with some extraterrestrials in this county seat of Chavez County. This is what draws many tourists to this part of New Mexico, since the area is popularly known for the 1947 Roswell UFO Incident (though the location for that UFO crash site is actually 75 miles away). “In July 1947, something happened northwest of Roswell, New Mexico, during a severe thunderstorm.” So begins the story and mission of the International UFO Museum and Research Center. Dedicated to “educating the general public on all aspects of the UFO phenomena,” the UFO Museum attempts to give a balanced and serious view of all things UFO. 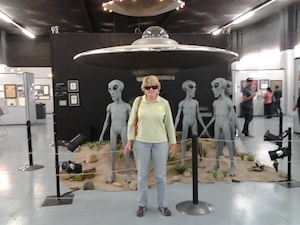 Once you pass through the glass doors of what was once the Plains Theater (114 North Main Street, Roswell, NM 88203; 800-822-3545; info@roswellufomuseum.com), you are immediately offered exhibit after exhibit of the Roswell Incident, crop circles, Area 51, UFO sightings, ancient astronauts, and abductions. Newspaper articles on poster board or displayed in glass cases attest to the firm belief that E.T. — or his cousins in space — visited our blue planet. All in all, it is a fun contrast to museums of so-called hard science. A few miles away from the UFO Museum is another museum gem. Inspiring “discovery, creativity, and cultural understanding of the art and history of the American Southwest and beyond,” the Roswell Museum and Art Center (100 West 11th St., Roswell, NM 88201; 575-624-6744) deftly combines an art museum displaying the works of local and regional artists, a recreation of the workshop of the region’s famous father of modern rocketry, Robert Goddard, and The Rogers and Mary Ellen Aston Collection of the American West. This eclectic amalgamation of art and artifacts works seamlessly to demonstrate the diversity of contributions to this area of New Mexico and present a link between local, regional, and world histories. The 50,000-square-foot facility houses 12 galleries dedicated to the exhibition of art and history, the Patricia Lubben Bassett Art Education Center, and the Robert H. Goddard Planetarium. When we were there, the art galleries displayed (among others) the whimsical works of ceramic artist and educator Aria Finch in a show titled “Tweeting Elations”. Her juxtaposition of human and animal (particularly bird) figures in mysterious dialogues allow viewers to give their own interpretations of these conversations. Recreating Robert Goddard’s workshop gives the visitor a true sense of science history. It is almost as if you become a participant in this New Mexico native’s brilliant work. Hand tools, powered machinery, and copies of his rudimentary rockets practically beckon you to grab a piece of equipment and join Mr. Goddard in his quest toward space. Around the corner after exiting Goddard’s laboratory, you come face-to-face with one of the five topical thematic clusters of The Rogers and Mary Ellen Aston Collection of the American West. The totality of cultural change and interaction over time (Family and Community, Spirit, Farming and Ranching, Trade and Exchange, and War and Conquest), titled West of Beyond, contains over 2,000 wonderful artifacts representing the uniqueness and interdependence of First American, Hispanic, and Euro-American cultures. It is a fascinating portrayal of human interaction with the environment of this corner of the Southwest and with each other. Interspersed among the artifacts are Rogers Aston’s own sculptures of the American West. To anyone appreciating art, science, history, and culture, this museum is invaluable in understanding the present and past of southeastern New Mexico. Also invaluable is the price of admission… FREE! Roswell, NM. Truly an inviting tale of two museums.